Teens are so full of potential, so full of life, so...sleepy. Research shows that most teens do not get the sleep that they need on a daily basis. Each person has their own need for sleep. This need may vary from one person to another. Teens are at an important stage of their growth and development. Because of this, they need more sleep than adults. The average teen needs about nine hours of sleep each night to feel alert and well rested. Teen sleep problems can begin long before they turn 13. The sleep habits and changing bodies of 10 to 12-year-olds have a close link to the teen years. The sleep patterns of teens are also firmly set in their lives. It is not easy for them to change the way they sleep. Thus teen sleep problems can continue well into their years as adults. For these reasons, the information found here may apply to anyone from10to 25 years of age. There are two main factors that affect how sleepy or how alert you are at any given time in a day. The first is how long it has been since you last slept. This is called the sleep-wake balance. If you stay awake for too long, your sleep-wake balance will be off. This will make you sleepy. The second factor that affects your level of sleepiness is your internal body clock. This clock controls the "circadian rhythms" in your body. The word "circadian" means to occur in a 24-hour cycle. These rhythms make you feel sleepy or alert at regular times every day. Your internal clock tells your body when it is time to sleep at night. It also tells your body when it is time to be awake during the day. Everyone's body has this natural timing system. When you feel sleepy at night, your circadian rhythms are telling you it is time to go to bed. Most people feel a mild need for sleep in the afternoon. This need to sleep grows much stronger at night. Because of this set rhythm in your body, the urge to sleep will be triggered at these times of day. This occurs no matter how much sleep you got the night before. But a lack of quality sleep can also make you tired at the wrong times of day. Teens can throw off their body clocks by often staying up late at night. Their clocks will also be off if they are always changing their schedule of when the sleep and wake-up. When their internal clocks are not set right, teens can become very sleepy when they should be wide awake. This can cause them to fall asleep at school, at work, or while they are driving. Puberty is a time when your body begins to go through many changes. It is the stage of life when you become physically able to reproduce sexually. There are many signs that show when this process is underway. Girls see their breasts develop and have their first menstrual period. Boys start to grow facial hair and hear their voices begin to deepen. Girls have always begun to enter the stage of puberty earlier than boys. Typically, this is between the ages of 10 and 11. Boys usually enter puberty a couple years later. Today, some girls begin to show signs of puberty as early as 7 or 8 years old. The natural shift in a teen's circadian rhythms is called "sleep phase delay." The need to sleep is delayed for about two hours. At first, teens may appear to be suffering from insomnia. They will have a hard time falling asleep at the usual time. While they begin going to sleep later, they still need an average of nine hours of sleep at night. Because most teens have to wake up early for school, it is important for them to go to bed on time. If they go to bed late, they will be unable to get the sleep that they need. This change is a normal part of growing up. With some extra care, teens will quickly adjust to the new sleep schedule of their bodies. If teens resist or ignore this change, they will make this time of transition very hard on their bodies. They will only hurt themselves by staying up too late at night doing homework or talking with friends. Using a lot of caffeine or nicotine will also make it hard for a teen to get quality rest. At the end of the school week, many teens are worn out from all the sleep they missed. They think that sleeping in much later on the weekend will help them catch up. This only throws their body clocks off even more. It will be even harder for them to fall asleep and wake up on time when the new school week begins. Teens have to balance the weight of many demands on their time. The biggest of these demands is school. Most schools start class very early in the morning. After a long day at school, teens may also have to study for hours at home. An early start and a lot of homework can combine to make it hard for them to get to sleep on time. Teens are faced with a lot of other things that compete for their time. Once they are old enough, many of them begin to work after school. Some simply want to have their own money to spend. Others have to do this to help their families. Older siblings may also be needed at home to look after younger brothers or sisters. After class is out, schools offer many sports teams, clubs, and activities that teens can join. These can take up as much time as a job. Of course, many teens also like to spend hours of their time with friends. With all of these options facing them, there simply isn't enough time for teens to do it all. They have to give something up. Far too often, it is their sleep that gets left out. Peer pressure can also cause teens to make poor decisions that will affect their sleep. They may stay out too late, drink, smoke, or use drugs. All of these things can disturb their sleep patterns. It is also common for teens to simply have a wrong view of sleep. They see it as something that keeps them from the things they want to do. It is something to be conquered. It becomes a contest to try to get by on as little sleep as possible. They rarely consider their need for sleep and how it affects all that they do. The burden of these demands combines with changes in their bodies to make it hard for teens to get the sleep that they need. This causes them to fight a daily battle against sleepiness. They struggle to wake up and make it to school on time. The need for an alarm clock to wake up is a sign that they are not getting enough sleep at night. They may doze off during class, or sleep through family activities on the weekend. Being sleepy also makes them grouchier and more irritable. Feelings of depression can also be caused or enhanced by sleeplessness. Teens are unable to think as clearly or perform their best in school, sports, or at work when they are tired. A lack of sleep will also put them at a greater risk of being in an accident in the car or on the job. Many barriers prevent teens from getting the sleep that they need. Their body clock begins to shift. They face new pressures at school, home, work, and with friends. They are faced with decisions they haven't had to make before. All of this comes at a time when they also have many other changes in their bodies, emotions, feelings, and moods. They need to get plenty of sleep during these changes. This will help them feel their best about themselves and about life. A lack of quality sleep will only make this stage of life harder for them. Obstructive sleep apnea (OSA) occurs when the tissue in the back of the throat collapses during sleep. This keeps air from getting in to the lungs. This is very common, because the muscles inside the throat relax as you sleep. Gravity then causes the tongue to fall back and block the airway. It can happen a few times a night or several hundred times per night. These pauses in breathing briefly wake you up and disturb your sleep. This can cause you to be very tired the next day. Young men who are overweight are at a higher risk of having sleep apnea. Narcolepsy is a sleep disorder that causes people to feel severely tired during the day. They may fall asleep suddenly at any time or place. These "sleep attacks" can occur while eating, walking or driving. This disorder most often begins to affect people when they are between the ages of 15 and 25. Huge swings in emotions and moods are also common in teens. This can result in major sleep issues. In extreme cases, depression can develop. This can play a huge role in disrupting a teen's sleep patterns. 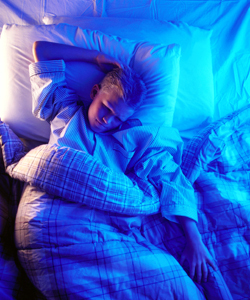 Medical conditions such as epilepsy or asthma can cause teens to have a hard time sleeping. Many medications will also affect how they sleep. You should often remind your teen to never drive when feeling tired. Crashes related to drowsy driving take the lives of more than 1,550 people every year. These crashes are most often caused by young people under the age of 25. Their lifestyle choices make them more likely to be driving when they are sleepy. Be prepared to offer other options if you expect that your teen may be too tired to drive. A family member, a trusted friend, or even a taxi can provide a much safer ride for a sleepy teen. Parents also need to help teens make wise choices about their time. Check up on your teen's schoolwork load. Help your teen balance the demands of school, work, clubs and sports, family, and friends. Decide what is most important, and help him or her choose what may need to be eliminated. Teens who work should try to limit their work hours on school nights. They can put in longer hours on weekends to earn the money they want or need. Try to help your teen have a proper view of sleep. Sleep is not something to fight off or try to avoid. Sleep greatly benefits teens who make it a priority. They feel more alert and have more energy. They think more clearly and make better decisions. They will be happier and enjoy life more. There are simply too many benefits of good sleep for a teen to miss out on them. It can be hard to determine the cause of a teen's sleep problems. Talk with a family doctor if these problems with sleep continue for more than a couple weeks. A doctor or a counselor can help teens find ways to deal with any stress that may be causing them to have a hard time sleeping. They may need to see a sleep specialist if poor sleep continues to affect their daily lives. A sleep specialist has the expertise to find the source of sleep problems in teens. He also knows what is needed to help teens begin to get the sleep that they need. Parents should create a calm atmosphere in the home at bedtime. Teens should have a regular, relaxing routine just before bedtime. They often have busy, hectic schedules. They need a chance to unwind at night. To help them relax, teens should avoid activities that will excite their senses late in the evening. They should find another time for computer games, action movies, intense reading or heavy studying. They should not have anything with caffeine (including soda and chocolate) after 4:00 pm. They should also avoid smoking and drinking. Along with hurting their health, nicotine and alcohol will disturb their sleep. A regular exercise routine and a healthy diet will help them sleep better at night. Keep the lights dim in the evening. Open the curtains or blinds to let in bright light in the morning. This helps keep their body clocks set at the right time. If they must take a nap, they should keep it to under an hour. It can be hard for teens to get enough sleep during the week. They may need to wake up later on weekends. But they should not wake up more than two hours later than the time when they normally rise on a weekday. Sleeping in longer than that will severely disrupt a teen's body clock. This will make it even harder to wake up on time when Monday morning arrives.